Aaron Dean Fluckiger was born April 27, 1928 in Afton, Wyoming the second of 17 children! He was raised in Star Valley, Wyoming and after graduating high school went on to attend Brigham Young University. In 1956 he moved to Ogden, Utah and began selling sewing machines door to door. Two years later, in 1958, he opened a department, selling sewing machines, in the basement of the Bon Marche. He was soon moved upstairs next to the watch repair where he began learning to fix watches when business was slow. He loved it. He became a Master Watch Maker and was certified through the Gemological Institute of America in Gemology. 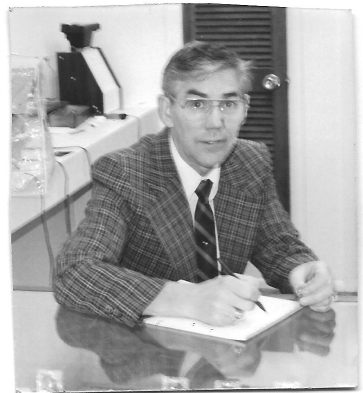 He founded Aaron's Jewelry and Sewing Machines in Ogden, Utah in 1967. For nearly 10 years Aaron's Jewelry supplied the Ogden area with not only fine jewelry, but quality sewing machines as well. It wasn't until 1975 that Dean decided to drop the "Sewing Machines" from the name and focus solely on fine jewelery and time pieces. In 1981 Dean, along with his lovely wife Norma, served an LDS mission to Bolivia, South America while their children ran the store. 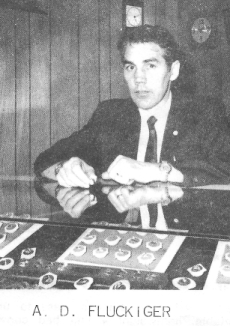 Upon his return Dean opened a store in the Ogden City Mall and one in the Newgate Mall where Jay Fluckiger, his youngest son, became co-owner and operator. Jay eventually bought the Ogden Mall store in addition to the Newgate store and has been running the business since. Dean retired in 1991, but continued to repair watches and clocks for Aaron's for years until his death in 2005.